My 'Big Beef ' SuperNaturals Mighty 'Matoes are being tested in my garden and so far, doing well - even in this blistering heat. If you were one of the lucky ones to get your hands on a Mighty 'Mato, here are some tips from the co-developer, John Bagnasco, of Garden Life, that should help you grow the perfect grafted tomatoes. Avoid over-fertilizing your Mighty 'Mato. Just feed it as you would a regular tomato. Mighty 'Mato is happiest planted in the ground, but if you need or prefer containers, use at least a 15 gallon size or a half wine barrel. Pruning is also crucial to contain and direct the plant's energy to fruit production. For all grafted tomatoes, remove suckers (side shoots) that form below the graft. Improve air circulation by removing all branches and suckers from the bottom 10 or 12 inches of the stem. If plants are getting too dense and bushy, you can remove a branch of foliage here and there to encourage air circulation. 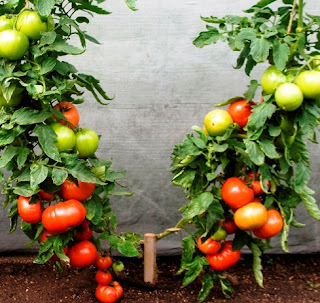 Bagnasco says that his favorite way to grow a grafted tomato is to prune it to two laterals (the main stem plus the side shoot or sucker just below the first fruit cluster) which are then trained up a trellis into a V shape. Throughout the summer, continue to pinch off the suckers that appear on both the leaders. Wanna' talk about trellis making? Ha! That's next time! By the way, the image is what we can expect to see from Mighty 'Mato. Can't wait! Happy gardening!